Hasbro is release figures to go with the new Marvel Rising Secret Warriors but instead of doing them in 7 inch Megotype to match the 8 inch size Mego they are instead releasing them in 11 inch style to be teenagers to Barbie size figures. Huge mistake. This is a pass for me. 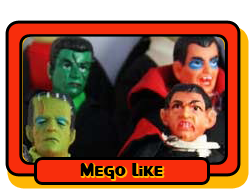 So this puts the stop on Mego to release Marvel style Megos from what it looks like. It is a shame that Hasbro could not see the possibility that by doing this in 7 inch "Mego-Like" style that would have had a chance to offer cloth-type action figures that both boys & girls could play together with have to deal with boys playing with "Barbie's". Holy crap. How late to the DC Superhero Girls party could they be? Maybe they think because Matty's dropped this look, it left them an opening. How does it "put a stop" on Mego? They had no Marvel rights to begin with, and this is a 11 inch fashion doll line. The way scales are farmed out now, 8 inch scale is still in limbo and more than likely still strangled by Hasbro's price point demands. This line isn't marketed to us guys. It's trying to hit the girls that the cartoon movie is aimed at. Why do they care about matching Mego? No kids know that format. The show is being revamped, and the toys have been on clearance in a lot of places. But then I've see a few new ones pop up, looking like the original design that the revamped show is replacing.